The 1st quarter of the year began on a high note with the stock market hitting new highs during January. 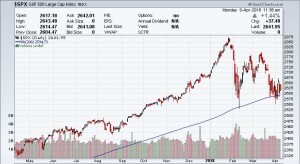 The anticipated tax cuts were implemented, and the stock market had a fairly standard “sell the news” reaction, meaning it had gone up in anticipation of the tax cuts being implemented, drawing in a lot of money that had been out of the market, just as the big institutions opted to take profits. February brought us a major sell-off as the new investors panicked and sold trying to avoid a huge loss. Just as we had written during 2017, we had a higher than average level of cash and short-term bonds on hand ready to invest it when a correction came about. As such, we turned into buyers during the sell-off and rode the recovery higher during late February and early March. Even though late March and early April brought another sell-off, it was a higher low than early February. 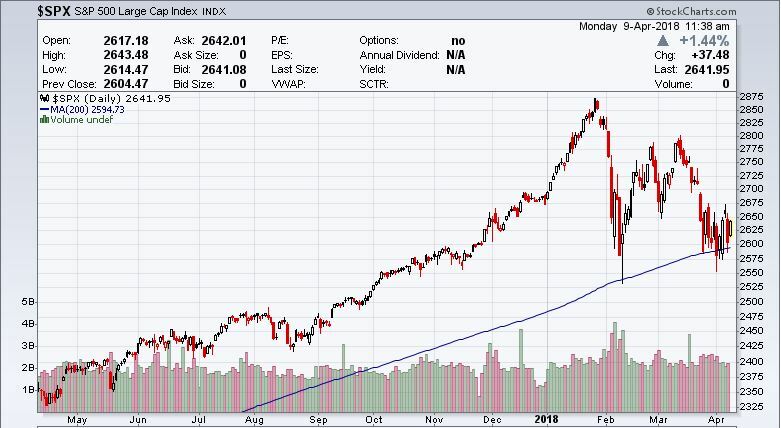 Our purchases during the February correction have profits as the market is now consolidating on the 200-day moving average line, a sort of “line in the sand” for the stock market between being in a bull market trend or bear market trend. Look at the graph and you can see how the 200-day moving average (blue line) is acting as strong support for the current bull market trend. Moving into the 2nd quarter, the economy is positioned for short-term growth after Congress passed a hugely deficit budget. This, coupled with the tax cuts, will provide fiscal stimulus for 2018, probably significantly so. Corporate earnings are anticipated to show a roughly 12% growth rate based upon the tax cuts and economic growth. The long-term question is whether the huge deficits from the spending bill on top of the deficits from the tax cuts, and on top of the deficits brought forward from previous years, can be offset by economic growth from the fiscal stimulus. That is clearly what the government is hoping and planning, but it will definitely not be an easy road with the current policy of the Federal Reserve. Offsetting the fiscal stimulus, we know that the Federal Reserve is in monetary tightening mode in a bid to offset increasing inflation. Monetary tightening negatively impacts economic growth, which puts it at odds with fiscal stimulus. As the Fed continues to raise interest rates and sell bonds that they accumulated during their efforts to stimulate the economy, we will certainly have a war of competing economic policy that ultimately provides an uncertain forecast for 2018. When we add in the hard line the government is taking on trade and the potential impact of retaliation by trading partners, investors are understandably concerned and quick to hit the sell button at any sign of concerning news. The stock market has already shown how dependent it is on low interest rates to move higher. The outlook for rising inflation and higher interest rates will yield a more volatile and cloudy near-term future for the markets. If the fiscal stimulus provides us with an ultimately higher stock market in 2018 and an economy that grows anywhere near the target 3% that the government desires, we will likely see a point in the future when the stimulus has less impact. Rates materially higher than today with less impact of the stimulus will be a major headwind that could send both the economy and the market materially lower, raining all over our bull market trend. However, that is not the likely scenario for at least the next couple of quarters. Our strategy for clients invested in individual stocks is to focus on the areas of the market that benefit from higher interest rates (banks and brokerages), have macro catalysts behind them like demographics (hospitals and health insurance), a consumer with more disposable income after the tax cuts (restaurants, retail), agriculture that benefits from inflation (the producers and the commodities themselves), domestic technology and telecommunications infrastructure (cloud companies, cell phone towers), geopolitical turmoil (defense, cyber security, precious metals), and companies that have less exposure to foreign trade (many of the industries above). Our strategy for clients invested in the bond market is to focus on keeping durations short, adding adjustable rate securities, inflation protected securities, and laddering individual bond portfolios where the account size allows. This entry was posted on Monday, April 9th, 2018 at 11:13 am. You can trackback from your own site.